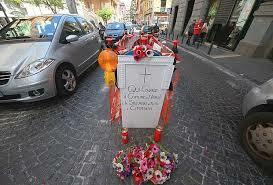 (May 28) The papers report that sampietrini, Little Saint Peter Stones, are finally on the way out. That's what cobble stones are called in these parts. There is a separate entry on these delightful little bone and chassis-rattling darlings. They've been saying they were going to get rid of them for at least ten years. (There is another Italian expression with St. Peter —"Talk about building St. Peter's!" people murmur, to mean anything that takes a verrrry long time to do. I wonder why that just occurred to me.) Yet they have, indeed, succeeded in repaving with asphalt some of the streets in Naples. Now via Marina, the long east-west road along the port is up for the change. Strangely, there is nostalgia for cobble stones; they seem to remind people of horse-drawn carriages and all those quaint and delightful little things from the good old days--the Black Plague, the Thirty Years' War, etc. (The stones are picturesque and will no doubt remain on those streets where tourists stroll, such as the historic center of town.) Of course, with today's traffic they pop out of the road-bed all the time (not the tourists, the cobble stones) thus pocking the city streets with the more modern symbol of the bad new days —the pot-hole. Some holes in the road have been there for so long that they have taken on anthropological significance, which fact I cheerfully leave for others to decode; one near my house was so historic that residents of the area covered it with flowers and put a make-shift altar into place, marked with a cross and scrawled with a prayer for those who had to drive along the street (image, above, from il Mattino). (May 30) There is a major battle looming between the major of Naples, Luigi de Magistris, and the Superintendent of Culture, Giorgio Cozzolino. The latter has just signed a decree closing Piazza del Plebiscito (photo, right) to events such as concerts and installation art. Such events have played prominently in the life of this largest public square in Naples ever since it was cleared of cars, spruced up and restored to the city in the 1990s. It has hosted rock music and opera, live theater, horse shows, New Year's firework displays and puzzling (but popular) installations of gigantic works of art. All of this will cease if Super Art Guy has his way. The mayor has said: "We respect laws if they make sense. If, however, they are the result of capriciousness, we shall take necessary legal steps. The squares of our city belong to the people and not to bureaucrats... the people want the spaces in their city—the squares and parks, the museums—to be open. I will not back down on this." (May 31) Speaking of pit stops, the Ferrari car company is setting up a Driver and Pit Crew training village along the seaside this weekend. 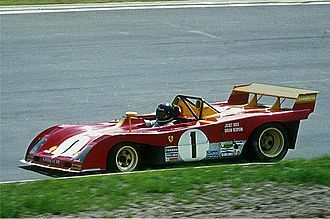 There will some famous cars on hand, including Michael Schumacher's F2002, with which he won the Formula 1 championship in that year. Most of the training will be on simulators, of course, so you won't see any teen-aged (or even middle-aged) dream chasers putting the pedal to the metal along the one-mile straight-away of via Caracciolo. (By the way, the cops are complaining that no one seems to notice the 30 kph/20 mph speed-limit along that road. That's insane. People drive 30 kph in my driveway!) There are a lot of sponsors, and the event will be flooded with Ferrari paraphernalia, gizmos and sundry splendid accoutrements—maybe even t-shirts and bronze rampant horses (the Ferrari logo). There will also be pit crew competitions. I have read that a 10-second pit-stop (to refuel and change four tires) by a professional crew is a tad slow. The boys of summer this weekend will be training to see if they can break 10 minutes. By that time, the race will be over anyway, but you will have had some fun. (June 9) A journalist made three mistakes in one sentence the other day, a record even for the local fish-wrapper. He reported that five precious palm trees had been stolen during the night from our beautiful Botanical Gardens. The plants, he said, were of the Encephalatros [sic] species. First, they weren't palm trees; they were cycads (ok, they look like palm trees). Second, the species is not Encephalatros, it's Encephalartos [sic]. Maybe that's only two mistakes, but somehow it looks like three. Other than that, it's a depressing story. In spite of the participation of 169 nations in the Convention on International Trade in Endangered Species of Wild Fauna and Flora, there is a thriving black market for rare plants. There is a market for flowers such as orchids, medicinal plants such as ging-seng and, in the case in point, cycads, which can bring 15,000 euros per plant on the black market. The thieves simply scaled the side wall of the Botanical Gardens at night (it is not well guarded and maybe not guarded at all) and removed the plants from their large terracotta containers and left. It took them about an hour. The plants are from Africa and are highly valued. Cycads are one of the oldest plant groups on earth, surviving over 200 million years of evolution. They grow slowly and some specimens can be 1,000 years old. All species of Encephalartos are endangered. Theft of such plants is clearly not a random theft of opportunity—"Hey, Mugsy, look over there. No one is guarding that tree. Let's nab it." They know what they're doing and have no doubt been instructed by a botanist: "No, not that one, you moron. That's Toxicodendron radicans—Poison Ivy, to you!" These thefts are done to order, most likely the order of some foreign collector and not a local one. This is not the first time that the Botanical Gardens have been hit. (June 25) Even more bad news for Bagnoli. 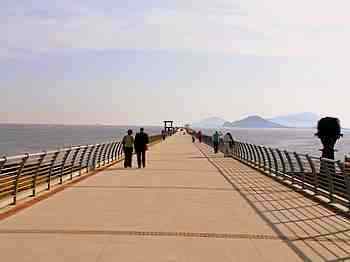 After the mob burned down Science City earlier this year, the North Pier was about the only place left that hard-pressed citizens of Bagnoli could rely on to get away from it all. It was a nice 1-km walk (or jog or skip) out and back over the sea. It is now locked. You can't get out there. The sign near the locked gate says "Please excuse the inconvenience, but we are waiting for someone at city hall to start keeping promises." The city of Naples owns 90% of the shares in Bagnolifutura, the company charged with breathing new life into the monster known as Bagnolistein. There are 53 employees who supposedly work to keep the pier-beast alive. They are union members who claim they can't even get put on hold if they try to get through to someone at city hall for some sort of indication as to wages and other niceties. "Uh, he's gone for the day" is about as good as it gets. (June 25) One of my favorite places, the Thermal Bath complex in Agnano is on the auction block. This, according to the local papers, which accuse the city of selling off the "family jewels." That is not unexpected given the great wave of privatization still sweeping Italy even though the arch-privatizer, Berlusconi, is no longer at the helm. They tried selling the zoo and got nowhere; no entrepreneur was willing to take a chance. Now they've put out the invitation for bids on one of the loveliest places in the city. It's not really a sale, but a 30-year lease for one million euros a year. The lease-holder will have to renovate the premises, which include the hotel and restaurant (currently closed), the vast grounds (to include the installation of a golf course! 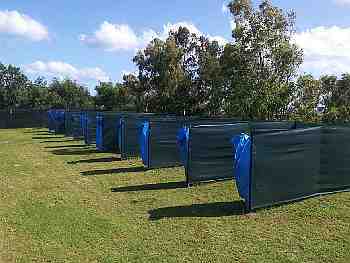 ), restore and maintain the outdoor pools (now closed), take over and run a second spa facility on the ground (currently run privately) maintain the inhalation-therapy and mud-bath facilities (still open) that are part of the state-run national health services, and maintain the adjacent Grotto of the Dog tourist site as well as the nearby Roman baths archaeological site. This is a major undertaking, make no mistake, but since the baths are well-known internationally, it is not out of the question that some big-time corporation will take it on. It might fly. I emphasize might. (June 25) We had an unusual "super moon" on Sunday. The moon made its closest approach to Earth for the 2013 calendar year, appearing larger and brighter than usual. (The effect is heightened by the normal "big moon" optical illusion near the horizon.) 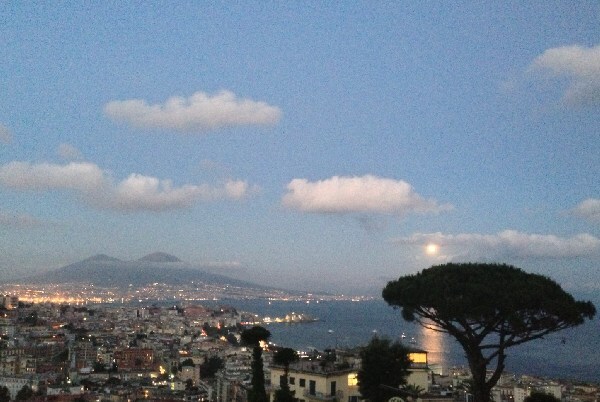 This is what it looked liked over the Bay of Naples just after moonrise, i.e. about 9 p.m. This remarkable photo was taken from the top of the street, via Tasso, overlooking the Mergellina and Chiaia sections of Naples. The moon has just risen to the south of Vesuvius over the beginning of the Sorrentine peninsula. We thank gravity, illusions, the good weather and, of course, the photographer, Pasquale Milanese, who was kind enough to let us use his work. The Mt. Etna site is iconic, encompassing 19,237 uninhabited hectares on the highest part of Mount Etna, on the eastern coast of Sicily. Mt. Etna is the highest Mediterranean island mountain and the most active stratovolcano in the world. The eruptive history of the volcano can be traced back 500,000 years and at least 2,700 years of this activity has been documented. The almost continuous eruptive activity of Mount Etna continues to influence volcanology, geophysics and other Earth science disciplines. The volcano also supports important terrestrial ecosystems including endemic flora and fauna and its activity makes it a natural laboratory for the study of ecological and biological processes. The diverse and accessible range of volcanic features such as summit craters, cinder cones, lava flows and the Valle de Bove depression have made the site a prime destination for research and education. Etna is also one of the 16 so-called Decade Volcanoes (as is Vesuvius), those identified by the International Association of Volcanology and Chemistry of the Earth's Interior as worthy of special study in light of their history of large, destructive eruptions and proximity to populated areas. They are named Decade Volcanoes because the project was initiated as part of the United Nations-sponsored International Decade for Natural Disaster Reduction (proclaimed in 1989). (July 24) It's not even August and The Summer Big Yacht Watching Festival is in high gear from my living room window. Notice these two beauties. I didn't get the name of the larger one at the bottom. I was told it was from Paraguay, but that may just have been a cover registry. It left before I managed to confirm that. (I refuse to say "it sailed." Think of the schooner you could have built with the same money--and then really sailed!) The yacht above it appears smaller, but it's hard to tell since it is farther away. It is, in fact, the Tatoosh, and is anything but small. The Tatoosh is a 303-foot (92 m) private yacht owned by Microsoft co-founder Paul G. Allen. The Tatoosh was gone this morning. So much for my plan to put on my bathing trunks and swim out and complain about Windows 8. (Sept 24) The BATPETOLA (Bad Translations from People too Lazy to Ask) award for the week goes to the anonymous but civic-minded locals who put up a poster in a coffee bar near my home pleading with people to take better care of their city. The Italian was non uccidere Napoli. That's pretty straightforward: a generic negative command—non+infinitive verb+ object. Even Google Translator has no problem with it, so fans of Artificial Intelligence may rejoice. It spits out an accurate Do Not Kill Naples (it does not like contractions—I do not know why) and even a zombie monotone pronunciation. If the offending translator had done that, then the phrase would have been correct. But, no, let's take advantage of that one English lesson from the 1980s and try to translate smettete di uccidere Napoli. That one has real problems due to the ambiguity in the English word for smettere. It means 'stop' as in "Stop doing that," but also as in "Stop (in order) to do that," giving us a fierce battle of gerund vs infinitive, an epic struggle on a scale unmatched since Godzilla vs Mothra. But, again, Google hangs in there. If you put in smettere di uccidere, it produces a correct Stop Killing Naples. No, indeedy, Mr. Monotone doesn't fall for that trap. Our guy, however, was too lazy to ask or look it up. Of course, they didn't need any English at all on the poster except to generate the "We are so damned cosmopolitan" effect. I realize there are no lives at stake here. This not a case of the "crash the glass" signs on ferry boats down at the port of Naples telling you how to get the fire extinguisher in case of an emergency (that was last week's winner and even then you kind of get the idea). But still—Stop to Kill Naples? I am going down right this second to deface the poster with a red marker; next to 'Stop to Kill Naples,' I'm going to write, "OK, I don't mind if I do." I do not pass judgment on the miracles of others. 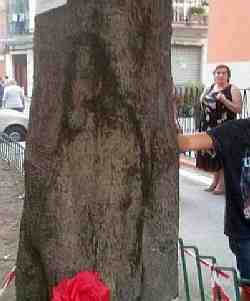 I merely note that on via Monte Faito, in the Berlingieri section of the Naples suburb of Secondigliano, up near the airport, an apparition or a very clever piece of tree rot with an amazing similarity to Padre Pio has appeared in the bark of a tree! Once it was reported by a local resident, someone shouted "miracle," someone else put a flower and "Don't touch! "-sign at the base of the tree and yet another cordoned the small lawn space off with construction-site tape; the traffic then backed up as everyone drove up there to park and take pictures. A local resident says that "We live in a section of town where terrible things can and do happen. Maybe this means that 'up there' someone is watching out for us." (Oct 2) The Four Days of Naples. Every year during the last week of September, Naples commemorates the so-called "Four Days [Quattro Giornate] of Naples," an armed civilian uprising in September against German forces in the city during WWII. 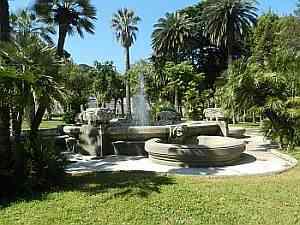 There is a square in Naples named Quattro Giornate; there is also a large memorial at the seaside near Mergellina, and the are various plaques in place to honor the event. (I originally mentioned this a few years ago at this link.) There was also a 1962 film directed by Nanni Loy about the event. For those who aren't sure exactly what went on, I have put up at this link a newspaper report on events in Naples of that week. It was published on Oct. 1, 1943, the day that the Allies entered the city of Naples. (Oct 20) No comment. There are a number of iconic snapshots of Naples: the Egg Castle here, Vesuvius there, and whatever else. There is one favored by many as representing the "authentic" life of real people—the web-like mass of clothes-lines strung from building to building across the narrow streets. On laundry day, you can have four or five stories of bed-sheets and underwear criss-crossed, fluttering in the breeze and bright sun like medieval banners—or maybe even medieval bed-sheets and underwear. Note the words "web-like." The papers report that a 20-year-old young man, despondent at unrequited love, threw himself from the fourth floor of a building on via Caravaggio yesterday. His fall was broken by the clothes-lines and he plunged not to his death but to minor injuries treated at a local hospital.